1 edition of Intelligent complex adaptive systems found in the catalog. Add another edition? Ang Yang, Yin Shan [editors]. Are you sure you want to remove Intelligent complex adaptive systems from your list? Published 2008 by IGI Pub. in Hershey . 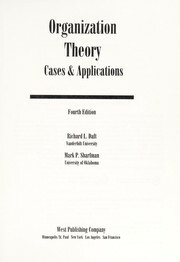 "This book explores the foundation, history, and theory of intelligent adaptive systems, providing a fundamental resource on topics such as the emergence of intelligent adaptive systems in social sciences, biologically inspired artificial social systems, sensory information processing, as well as the conceptual and methodological issues and approaches to intelligent adaptive systems"--Provided by publisher. Emergence in agent-based computational social science : conceptual, formal, and diagrammatic analysis / Jean Louis Dessalles, Jacques Ferber, Denis Phan. The allocation of complexity in economic systems / Jason Potts, Kate Morrison, Joseph Clark. Companion volume to: Applications of complex adaptive systems.